I did my first Week in the Life album back in 2011 and since then have committed to documenting one week in our life every other year. 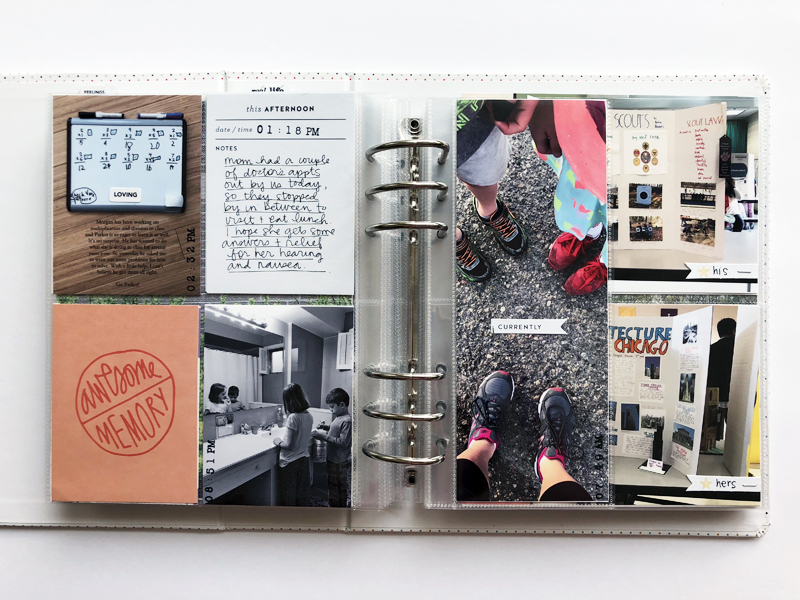 It took two previously failed attempts in 2009 and 2010 for me to figure out what worked for me because it is such an intense project - making sure you’re taking lots of photos, as well as dedicating time to write down all of the little details that happened. What you did, where you went, what you ate. By Sunday, I’m glad it’s over. After that thorough week of documentation, I need a break before I dive into editing, printing and assembling everything into a finished product. Getting this project done was a bit of a slow go for me last year. My Week in the Life was at the end of April. I created a plan and then edited and printed all of my photos at the end of May. Then it wasn’t until July that I dedicated an entire week to get one day of my album done each day. 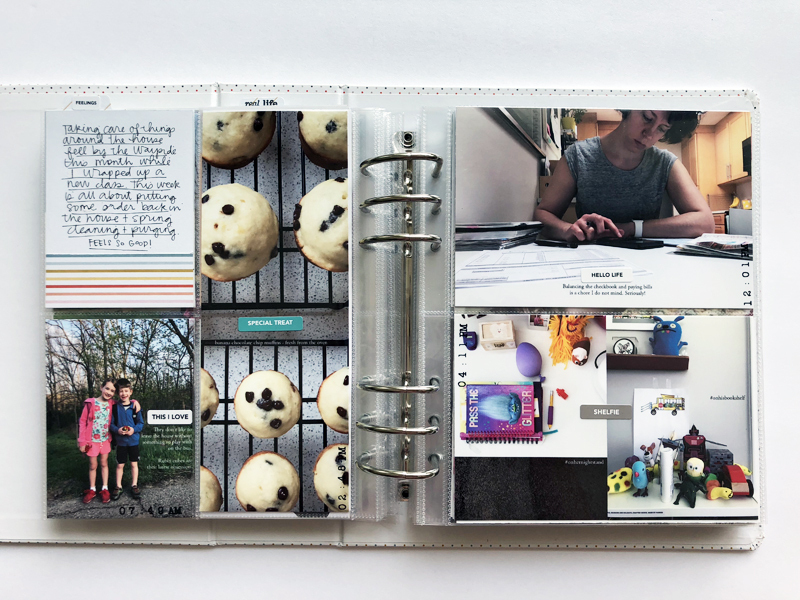 In this post, I’m going to share the completed album with you, along with notes about my process and little things I do to create consistency and ensure I'm telling a thorough story. If you just want to flip through my album, scroll to the very bottom of this post to view the photo gallery. For the opening page, I typed small 2x2 cards with our stats right now - including our names, ages, roles and things we love. Morgan drew mini portraits of each of us and I was originally planning on using them on the backside of this page and add actual headshots to the front. But, I loved her drawings so much that I scrapped the idea and added them to the front. 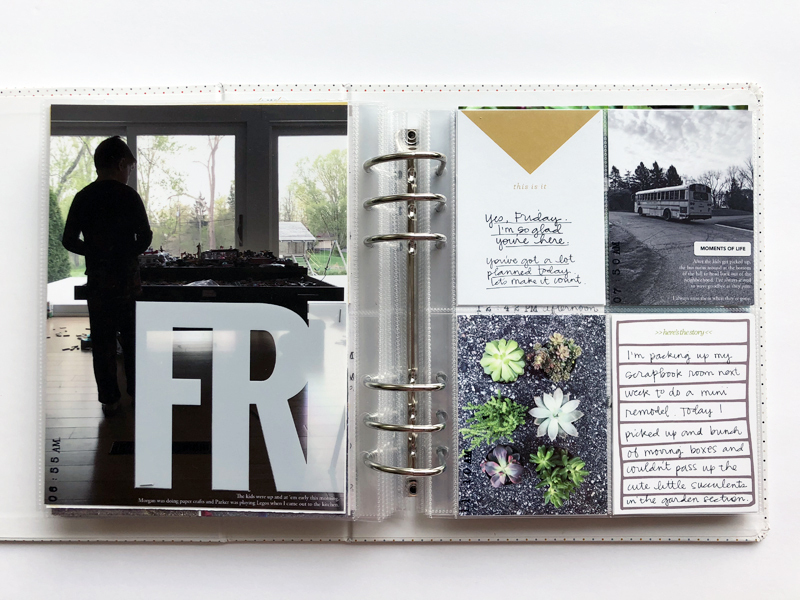 On the back of the opening page, I used the transparent numbers from the kit to record 8 of my favorite moments of the week on more 2x2 white cardstock. I backed the embellishments on the front with the same type to cover the backsides. 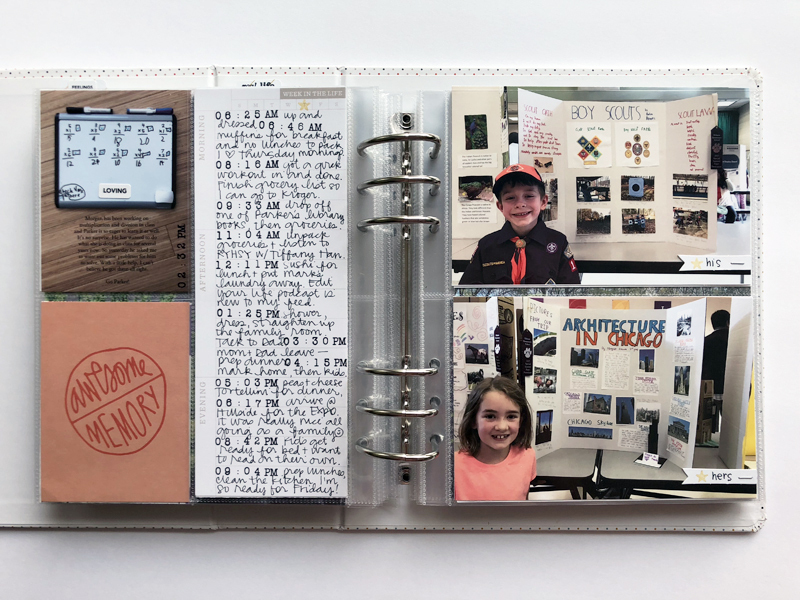 The backside of this 6x8 page is the beginning of my daily layouts and I needed something here to fill the space, so I created a Week in Review page. 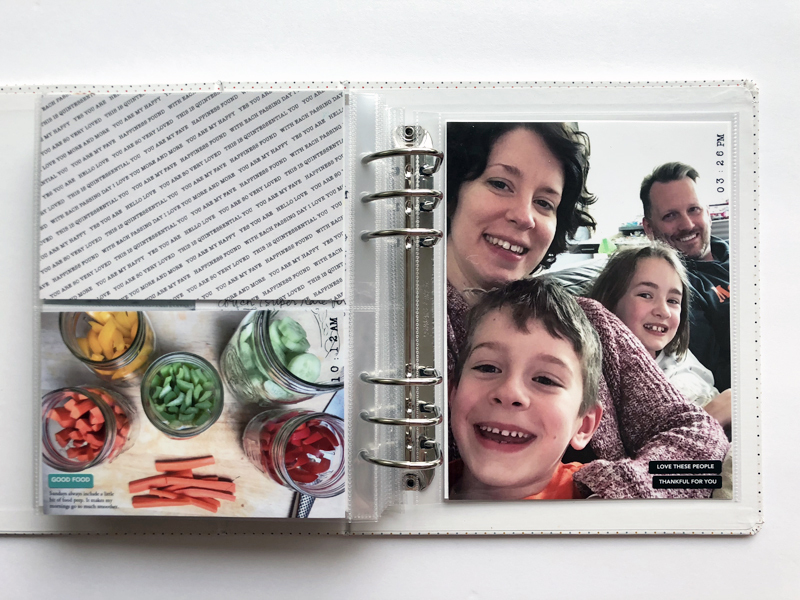 The transparency dividers didn’t work within my album the way I had arranged my pages, so I cut them down to use just the top tabs. 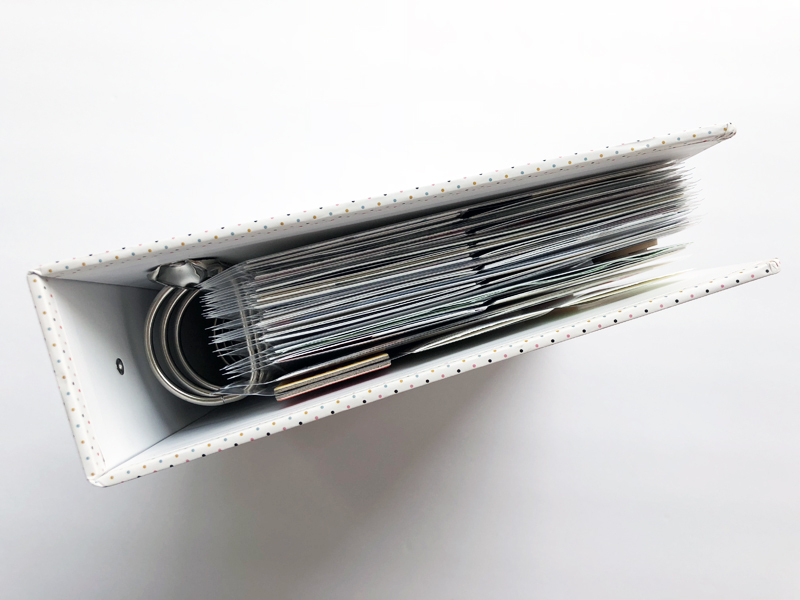 On white cardstock, I typed out highlights from each day and spaced them so I could lay the daily tab over the text without the tabs overlapping. Then I stitched down the left and right sides. This page took a little of trial and error to get the spacing right, but I love how it turned out! The final page is crazy simple - a piece of white cardstock with some typed text to close out the album. The white chipboard quotation marks were part of the kit as well. As I look back at some of my favorite albums and mini books, one thing I’ve noticed I’m always striving to achieve is not only balance, but consistency. A consistent color scheme. A focus on my photos and words. Consistent use of complementary embellishments. Making sure, for the most part, that each day has an equal number of photos. Things like that. Here are some notes I jotted down as I worked on this project and later after flipping through the completed album. 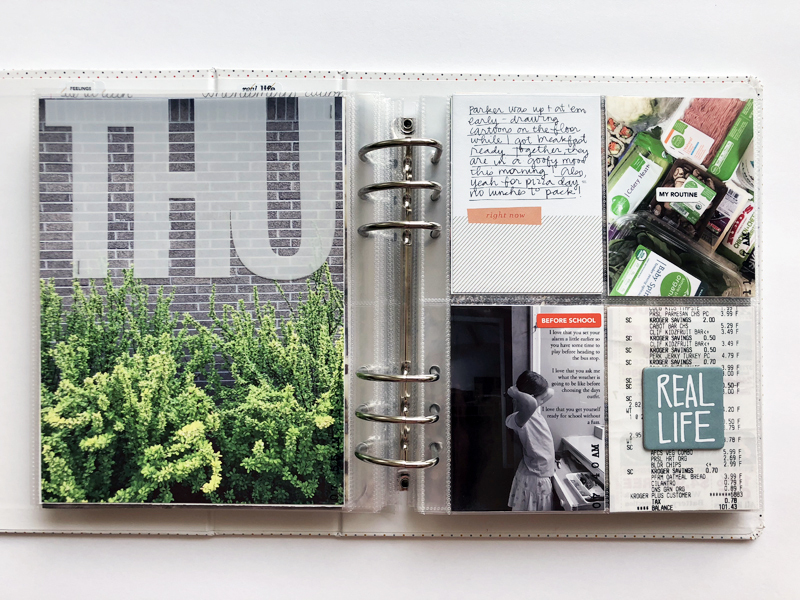 I used Ali’s album and kit which is one of my favorite ways to create a consistent album. I will not buy a kit these days unless I love at least 90% of it. I don't intend on using 90% of the kit on that single project, so it has to be versatile enough for me to use in the future as well. 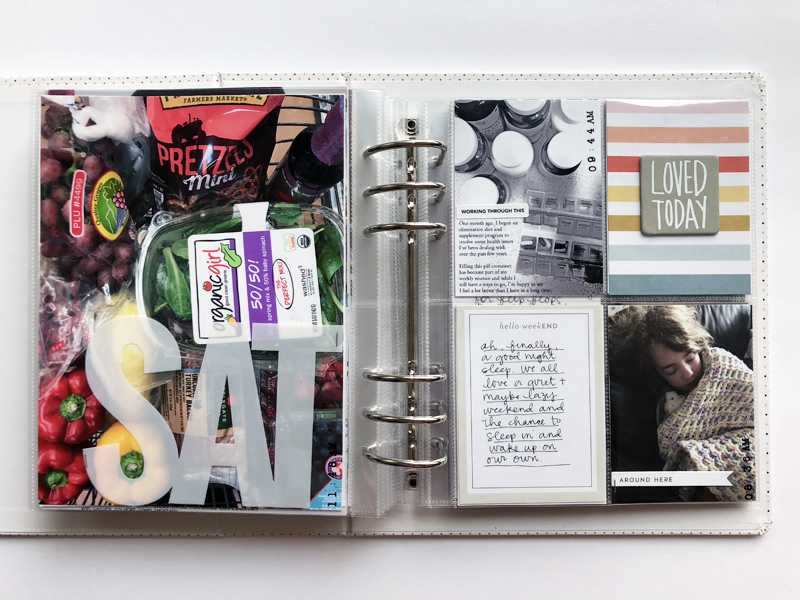 With a well-rounded kit, I know the product colors already coordinate and I can supplement with my stash to fill in any gaps, usually by adding in more neutrals with alphabet stickers, or more journaling cards. I always need more journaling card options. I put my page protectors in order so each day had the same number and arrangement of pages. Each day opened on the left side with a 6x8 and closed on the right with a 6x8. 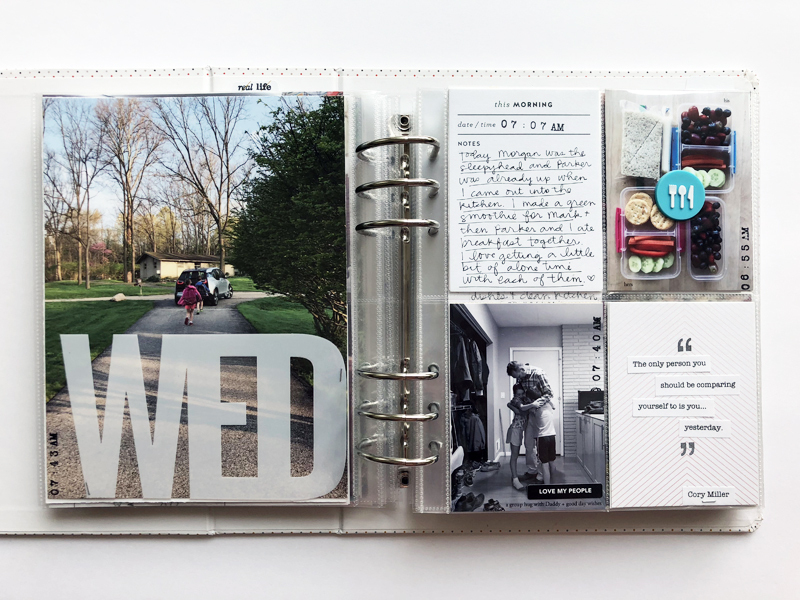 In between were three page protectors to hold 8-3x4's, 2-3x8's and 4-4x6's of photos, journaling, and memorabilia. I planned all of this before documenting the week so I was making sure to take a varied orientation of photos. Before starting, I knew I wanted to use the large day of the week transparency on the first 6x8 photo, so I was extra mindful of getting a vertical photo each day that wasn’t cropped so tight that the transparency would cover something important. 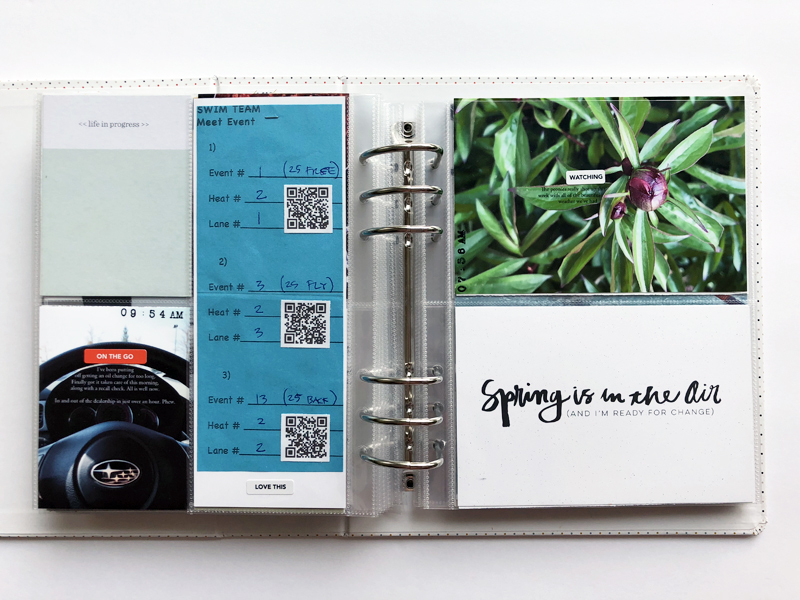 I used a time roller stamp from an old Day in the Life kit with black ink on most of my photos to note the time. Initially, I was trying to add the time in the same position on my photo (on the bottom right corner, for example) but that didn’t always work out. So I just stamped it wherever it worked best for that photo. 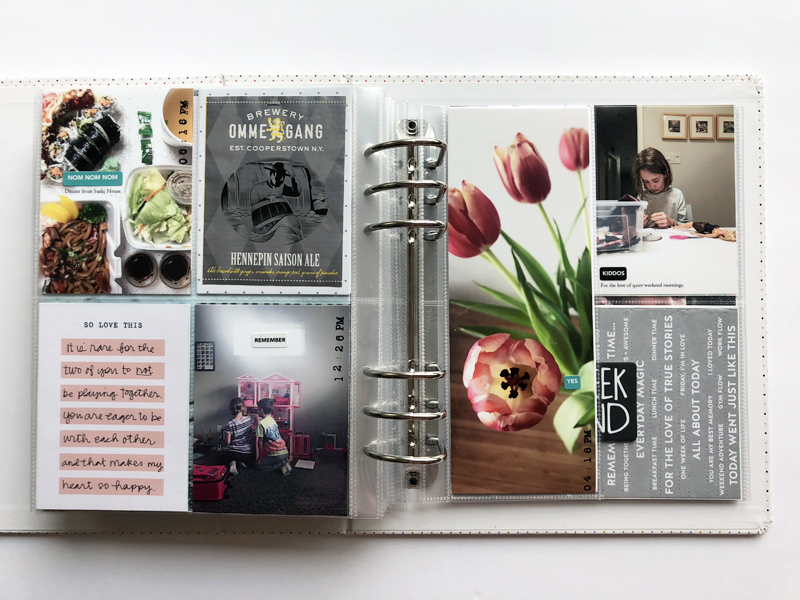 Each day I used a 3x8 journaling card that was from an old Week in the Life kit (2015 I think?) I used the time stamp again to record the time, then a little handwritten journaling on what was going on at the moment. 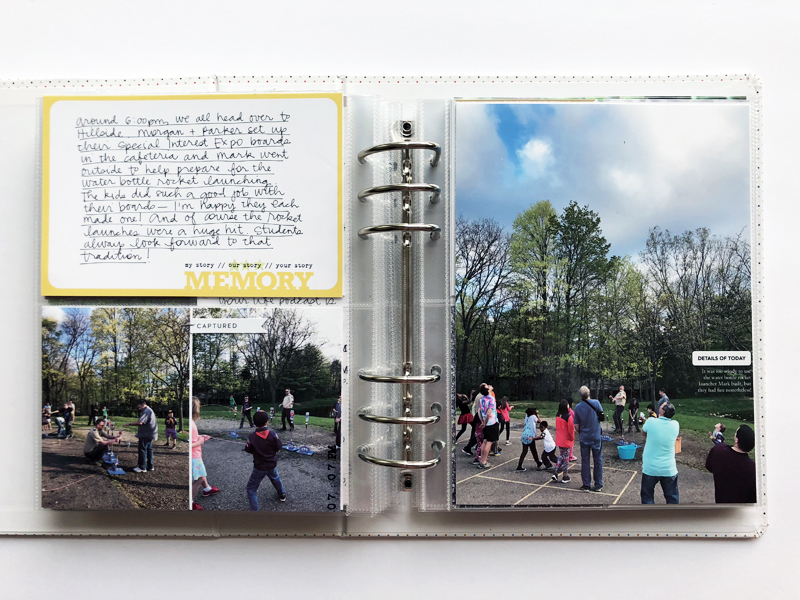 Between the regular journaling cards, the typed text on my photos and this larger 3x8 card, I gave myself plenty of opportunities to tell the stories of our days. I kept the colors balanced by adding embellishments like word stickers and toning down the loud or busy photos by converting them to black and white prior to printing. On the spine, I stamped “WITL” in the same Clearly Kelly alphabet stamp I used on the spines of most of my albums. Even though all of my albums are different colors and sizes, the similar spine helps to make them look a bit more cohesive on the shelf.